One of the most important things that you can do is to keep your business culturally diversified. This is especially true with the global environment that we have available to us through our world wide web. Just because you are traveling doesn’t mean that that stops. It would be a bit odd if you had a blog that was well-balanced and all of a sudden became a bit one-sided when you go out of town. It would appear as if you were not paying attention to what is going on with your blog while you are away. An even better reason to go for that culturally diversified blog while you are travelling is the opportunity! You are surrounded by new experiences and new information and so much that you can share with your blog readers! They will love you for it. The key thing is to keep your style and personality in telling the “story” while you are traveling and they will naturally feel like they are in your inner circle. I found this cute little guy quite by accident, even before I left on my vacation. He (or she?) 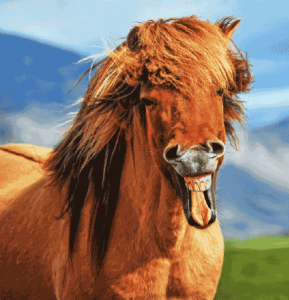 is an Icelandic Horse and looks quite different from the North American horses. Hey, even animals are cultural and we are not here to judge how they look or how they act. But, I find his smile (yes, that is called a smile) different (and cultural) from the smiles of the North American horses and I daresay, I have fallen in love with my little Icelandic horse! Even finding this endearing creature while surfing on a site like 123rf.com leads me to searching for more Icelandic adventures, arriving at a site that shows the Top hotels in Iceland. This is a perfect example of how one thing leads to another. It is also an example, in reading that article, how the cultural differences are not limited to people or animals, but the interesting and diversified places that one can stay, represented by a list of only ten places, and yet ten very intriguing places in Iceland. While traveling and maintaining day-to-day tasks, I would make sure that I never run out of content during this time. I would never let anything go dry. This pretty much means that you should update all of your social media, blogs, and email lists on a regular basis. Once you have decided on your destination, you need to write a schedule of all of the social media posts and emails that will be sent out for you (assuming you have someone helping you). If you do not have a helper, you can easily put together your own schedule using an Excel spreadsheet. I personally would have all of these marketing strategies automated by a computer or an application, if possible. Then, all of your wonderfully diversified cultural experiences that you are having, while traveling, can be additions to what you are already posting and that much more exciting and drawing that much more attention! Fortunately in the world of online business there are many ways that you can pretty much “buy” help and have people work for you on the internet. You can find different freelancers if you want, or hire a team of virtual assistants. I think one of the best websites where you can find people like this is upwork.com. All you have to do is post a job on this website, then literally 20 minutes later you may have someone who says “Hey I want this job. I think your job posting is fair and there is a fair wage here.” You can then hire them if you want to after you interview them one-on-one. This is an option for you if you are worried that your travels away from home and business will cause you to lose connection with your clients, blog readers, and social media followers. However, treat it like it is a foundation or mainstay and don’t let it replace the excitement and diversification that is at your fingertips, simply by taking a holiday in another location.